The DOPE bird personality test is one of those “don’t have to have a psychologist,” fun, and useful tools that I’ve permanently added to my personal development toolbox. You see, you really are a complex combination of many different characteristics, strengths, motivations, and experiences. It’s a gross understatement to say it’s tough to pin down “who” or “what” you really are in life. However, if you’re actively interested in finding out more about yourself, and you use the right tools to get the job done, you might just be surprised with what you find out. Why Does This Test Matter to Me? If you’ve never had tens of thousands of people to survey, question, and test about their personalities and innermost being, you’d really only have a set of assumptions to work with. That’s what we do, right? We’ve meet one person like Gary before so we assume this other person is a “Gary-like” person, right? I’m not saying it’s bad. I’m saying it’s a *tool* the mind uses to help you better understand the people you work with. Your mind uses a very large chunk of your energy just to keep going. Every little shortcut it can take, it will take. That’s the tool you’re looking into with the DOPE Bird Personality Test. This test is a tool that helps you break down your inner being, and those around you, into a set of thought-provoking questions that turn into mind-expanding results. I’m adding some emotion here because it’s a big deal. Would you rather keep living life, doing work, and handling your emotions with just assumptions? …or how about concrete research, data, and feedback? This is a test I find highly useful for my own life and daily activities and I’m confident you’ll find it useful enough to add to your career and personal development, too. Okay, Why Does it Have Birds In It? There are much more complex test available out there for sure. As a matter of fact, the Jung Personality Type test available here on this site deals with 16 main personality types. It’s a highly useful tool for the right person, right time, and right motivation. I’ve found the DOPE Bird Test to be the most useful, most fun, and most memorable test for the widest range of people. Dove – peaceful and friendly. Owl – wise and logical. Peacock – showy and optimistic. Eagle – bold and decisive. You can be a combination of the types above to give you a greater feel for how the birds work together and I go into much more detail inside the test and results. Just keep in mind the resulting information should be used as a guide to help you to improve your life based off of the findings. It’s short, simple, and fun. It’s not meant to be a psychological assessment of your life. You’ll have to pay $300/hour for those somewhere else. So, Who is this Test For Anyway? …oh and don’t forget regular folks like you and me! I’m sure you’ll have many other great ideas on how to use this valuable, practical, and fun self discovery tool. 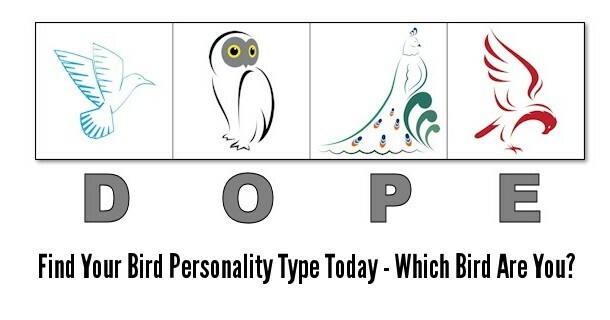 The printable test is available online and will help you to get a fun, high-level look at your preferred personality type by finding the bird type that most closely matches your answers to the test questions. Interested in finding out more? Please choose your options below.